If you have a child who is interested in riding horses, you may rightfully feel overwhelmed and confused by the amount of information and choices available to you. Whether your child fancies themself the next Kentucky Derby winner or champion rodeo rider, there are numerous paths to becoming an experienced and competent rider who can potentially move into the elite levels of equestrian sports. When you read about horse racing results or Olympic medals, know that all those victors were once novices too. Read on for a glimpse into how to introduce kids to horseback riding, with an emphasis on training all kids should have before specializing in any one riding discipline. ● Horses have blind spots in their vision that can cause them to spook, bite or shy away. ● The hind end of the horse is dangerous and should be given extra space. ● Some horses don't like to be touched everywhere, so always ask the owner or trainer first before touching. ● Most horses are trained to be approached on the left side, so they will likely startle if saddling is attempted from the other side. All children should wear a fastened helmet when around a horse, even before climbing in the saddle. If they are old enough, they should learn how to saddle and tack a horse, as well as how to groom one. Once a student can lead a horse safely and responsibly on the ground, they should begin basic equitation lessons. These are rudimentary riding skills that all riders should learn before progressing to a specific riding discipline like jumping, dressage or western. 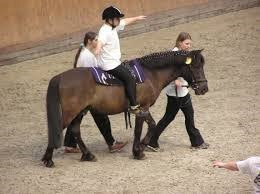 Equitation teaches kids how to get a horse moving, how to stop a horse and how to move through the various gaits: walk, trot, canter and gallop. It should also teach backing up and emergency one-rein stops in case a horse becomes unruly. Don't race for results at this stage of the game; this training is the most essential of all riding preparation. A major issue with many children with any new activity is sticking with it. Once the novelty has worn off, they may be tempted to move on to something else "more fun." It's the adult's job in this situation to both help them learn the life lesson of not quitting every time something is difficult and to help keep them motivated. One way to keep kids interested in riding is to expose them to high level riders in various riding specialties. Take them to the track and get them cheering for horse racing results, or go to a breed show in your area. This not only keeps them inspired but it lets them get a feel for different types of riding too. Another issue that comes up with some kids is wanting to buy a horse right away. A horse almost always involves more care and money than people expect, even seasoned horse owners. Before making that investment, it might be better to use a school horse, then lease a horse. Leasing allows you to see if your child can handle the responsibility of a horse and lets you test out different breeds. Until your child decides on a riding discipline, you may not know what breed you want. While some breeds can do almost anything, others are much better at certain skills. Arabians, for example, aren't very well suited for dressage, but they make excellent endurance horses. A German Riding Pony isn't likely to do well in high-level jumping, as they max out in height at about 15 hands. When you see horses line up in the starting gate at the track, you never know what the race results will be. Training kids in equine sports is a bit like that. You give them the best foundation possible and hope that they stay in the contest long enough to finish well or at least enjoy the route along the way! This article is courtesy of Canadian writer John Hawthorne. As a full time writer and fan of equine sports John is always interested in writing about ways to get people to participate in various riding disciplines. In his professional life he writes for an Australian based racing results website.